First of all, you wouldn’t be here if you weren’t interested in learning to wash your own fleece. But just in case you ended up here by mistake, here’s the link to Joybilee Farm wool roving in 3 natural colours. Commercial roving is lovely. Its perfect. It takes hundreds of individual fleeces, washes them together, picks them into a uniform mass and cards them together. Often the carding process is taken one step further, and the fleece are pin-drafted to take out all the short fibres, noils and veggie bits. The result is a perfect, uniform, rope ready for felting or spinning. Like grocery store hamburger, you know what you’re getting and its consistent every time. It’s rarely local. Your relationship is with the seller, not the manufacturer or the grower. That’s the price of perfection. At least when you buy commercial roving, you aren’t anticipating recalls, like with hamburger. But sometimes you want to experience real wool. You want to sme ll the grease. Wash it with your own hands and dream of a project that uses the best qualities of an individual sheep — its lustre, its crimp, its strength or softness. Or you just want to save some cash in support of your hobby. Here’s an easy way to clean a fleece and prepare it for spinning or felting. Do this part outside. Lay out the fleece. If it was rolled you will just unroll it and open it up. Check to see if its was skirted thoroughly. The shepherd should have taken all the poop-y bits away from the perimeter of the fleece at the sorting table. If not, take the outside 3 or 4 inches and pull them away from the fleece with your hands. Save these for the bottom of your planters (releases nitrogen and keeps pots from drying out). 2. Remove any parts of the fleece that are heavily contaminated with vm (vegetable matter). Sometimes the neck and top line are heavily contaminated so add these to your plant pots or save for garden mulch. Again, the shepherd may have already done this for you. 3. Shake your fleece outside. If you are going to process a lot of fleeces you might want to build a wool sorting table. That’s a table with an opening (slats or wire mesh) that will let the junk fall out of the fleece as your shake it. If you don’t have a sorting table then grab handfuls of fleece and give them a good shake. You want the small bits, dust and vm to fall out on the ground before washing. Place the shaken fleece in a basket ready for the wash. In the 70s it was cool to spin in the grease. This is the point when you would do this. Its not my preference. Just saying…. Do this outside, if you can. If you use your indoor washing machine or bath tub, it gets a bit messy. Fill a wash tub, washing machine or bath tub with really hot water (120F). Add 1/2 cup washing soda, 1/2 cup. dish detergent, 1/2 c. Simple Green (optional). Stir in to dissolve completely. Add fleece, by pushing down into the water. Use a stick so you don’t burn your hands. Cover tub with a lid or tarp to hold in the heat, if you are doing it outside. Leave it for 30 min. to 1 hour. Lanolin dissolves at 120F and re-congeals at 110F, so you want to keep the water hot to allow the lanolin to dissolve from the fleece, as well as the sheep sweat, so that it will rinse away. Drain the tub. Remove fleece. Refill with clean, hot water (120F). Put the fleece back in. Cover again to retain heat. Soak for 30 min. to 1 hour, without agitation. As long as you don’t agitate the fleece, you will not felt it. Repeat step 5 until the water that the fleece is soaking in stays clear. At that point remove fleece from water. If you have more fleece to wash – put them in this water and add soap and washing soda. You can reuse this water on garden plants or lawns — but bring the pH of the water to 7 before reusing it and allow it to cool. Dish detergent is high in phosphorous — its not organic. 7. Drain fleece and remove excess water. I have a wringer washer that will squeeze out the excess water. You can put it into a centrifuge to spin, or use a top load washing machine to spin out the excess water. Put fleece on a drying rack or in a basket somewhere warm to dry. Turn fleece during the drying time. Pick your fleece with your hands as its drying to open the locks and let remaining chaff fall out. You can willow the dry fleece with sticks to open the locks, too. Once the fleece is picked you can spin from the picked locks. Or you can card it on a drum carder, with hand cards or flick comb it with a flicker brush, to get it ready to spin or felt. Sometimes I pick the fleece, as I’m putting it through the drum carder. Some spinners suggest that life is too short to work with dirty fleece. I recommend learning this skill, even if you generally start with prepared roving. The number of breeds of sheep available in commercial roving is shrinking annually. Merino and corridale — both fairly soft fleeces, dominate the market. Stronger fleeces — used for carpets, upholstery and outer wear are losing market share. So if you want to weave a rug, a blanket, or a coat you end up with poor wear-ability using commercial rovings. Being skilled at washing your own fleeces allows you to use what’s available locally. You gain a relationship with local producers and you may even be invited to help on shearing day — giving you the first pick of the best fleeces available in your community. When I was first learning to spin, before we had sheep, I was invited to help at a local sheep farm on shearing day. I was rewarded with my choice of fleece — and then found that half the fleece had been placed in my car. That will give you a lot of spinning and knitting mileage. Now that you know how to wash your own fleece, here’s an easy felting project that will enhance your life — Wool dryer balls. 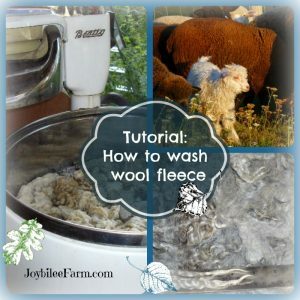 Have you tried washing your own fleece yet? Do you have any tips to share with our readers? Leave a comment.